Should I Move to Spain as a Single Parent? She was right, the way the city looks from above is beautiful, and the architecture and people of Barcelona are no different. People are polite and relaxed, the bus drivers say good morning to everyone, and the fresh bread, donuts, and coffee on every corner keeps us happy. I never thought I would be asking myself that question before. Actually, I never really envisioned even coming to Europe. But we’re here now, and we kinda love it. Is it a perfect location? No, it has its flaws, but the upside might be worth it. So, what would possess a single parent who’s lived on 3 continents (now 4) with his 5-year-old daughter to settle down in Spain? Let’s take a close look at the pros and the cons that I see. Firstly, the taxes are quite high. I’m a writer, so I would move to Spain under the autonomo visa, which is perfect for freelancers. But, the taxes on income here are a flat 20%. Plus, you’re required to pay into their social security which can take up to another 10% of your income. Living in Spain means giving them most of your money. I thought it was good a few years ago when I was Costa Rica, but it’s quite awful now! I guess I have a lot to relearn, and my daughter is getting her first full go at it as well. Lastly, none of our family lives in Spain. When we’re in Asia, Auburn can visit her grandparents and Chinese family members. When we’re in the United States, we can visit my parents, siblings, and new niece. In Spain, it’s just us. 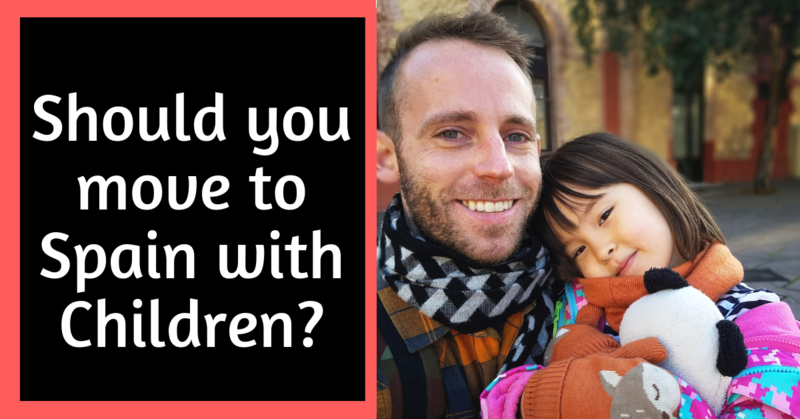 The culture, climate, architecture, Mediterranean Sea, food, transportation, and healthcare systems are just a few reasons it might be a good idea to settle in Spain as a single parent with young children. For starters, if we spent the next three years here, Auburn would spend her primary school perfecting Spanish. She would also have access to the Spanish healthcare system since I would be paying in the social security. We can swim in the sea and I can teach her to surf here. She lost that panda on this day. Poor thing. Most importantly, Barcelona feels safe to me. My daughter is my first priority and when I take her outside in Barcelona, I never feel a sense of danger. It’s an inviting city that seems like a wonderful place to raise children. What do you think? Is Spain somewhere to move with children? If you liked this post, please subscribe below to my newsletter where you’ll get all the latest content and offers on my upcoming books! How Much Does it Cost to Move to Thailand? SUBSCRIBE to keep informed and receive free offers!